Since 2014 Poland is the country with the highest share of temporary workers in the EU. Civil law contracts, a type of temporary contracts, allow payment of lower retirement pension contributions than implied by employment contracts. 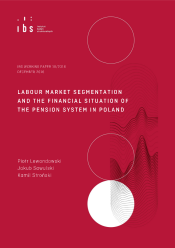 We use a cohort pension model to quantify the impact of civil law contract use on revenue from contributions and spending on pensions in Poland. Between 2005 and 2015, the rising incidence of civil law contracts reduced the revenue from contributions in the general pension system by PLN 2.4 billion per year on average. This widened the pension fund deficit by approx. 5%. In the future (2016-2050), the impact of civil law contracts on the revenue from contributions will wane because of demographic changes and rising educational attainment of the workforce. However, its impact on pension spending will increase with time, although it will be weaker than the effect on revenue from contributions. Hence, labour market segmentation will deteriorate the pension system balance. The obligation to pay contributions on all contracts of mandate from at least the minimum wage level, introduced in 2016, is not sufficient to balance out the impact of segmentation on the pension system balance.